Since it’s January, hospital food magazine and blogs everywhere are posting their top food trends for 2009. This year’s trends include upscale comfort food, drug cheap cuts of meat, pork, lots of egg dishes and beans. Beans are trendy? Apparently. Since I love beans of all kinds, sizes and colors, this is a trend I can definitely get into. This weekend, I was browsing the Rancho Gordo site looking for some bean-cooking ideas, and I came across this recipe for Drunken Beans. Beans with beer? Yes please. I cooked some dried Good Mother Stallard Beans (sub pinto or anasazi beans) with dried chiles de arbol and dried chipotle peppers. Then I sauteed spicy Spanish chorizo and garlic, added some pale ale and stewed the beans in that. The result? Something like baked beans, but infinitely more flavorful. We ate them with some Guava BBQ Chicken for a seriously hearty, spicy and delicious Sunday supper. So, be trendy this year and make yourself some drunken beans! Eat these with some barbequed chicken, pork chops, grilled steak or a big hunk of crusty bread. You can also saute some greens to mix into the beans and make some tasty tacos. Depending on the kind of beans you get, you may have to soak them overnight. To soak beans, place them in the cooking pot and cover with water, leaving about 2 – 3 inches of water over the beans. Cover and let them sit. When you’re ready to cook them, add the dried chiles and bring the liquid to a boil. Reduce the heat to medium-low, cover and let simmer for 2 – 3 hours, or until the beans are tender. While the beans are cooking, saute the chorizo in a large saucepan over medium-high. Once the fat has rendered and the chorizo begins to brown (about 5 – 7 minutes), add the garlic and saute for 1 minute. Remove the beans from the cooking liquid with a slotted spoon into the saucepan with the chorizo and garlic. Discard the dried peppers. Add the beer and salt to the beans and bring to a slow simmer. Reduce heat to medium-low and let the liquid cook down for about 20 minutes. 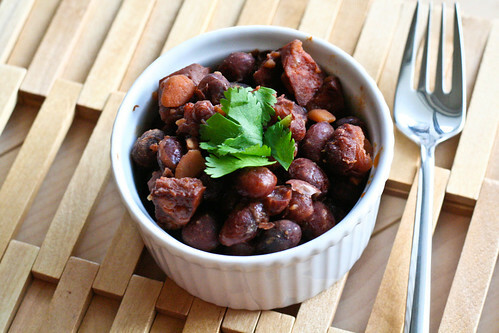 Beans with some kick and some chorizo…I’m down! This looks great. I’d never thought of beans in beer before. Our local meat market just started carrying chorizo and I got a whole bunch so I can finally make this and all the other chorizo ideas I see on your site!